You might have some questions about our beautiful Heroine in general or about her data. Below you find 95% of the questions that reach us. For all others reach out to us on the right. What does Onpage Hero do? She turns your Google Analytics account into an SEO suite by adding very relevant data points for each of your URLs, such as the titles, descriptions, number of H1 tags, etc. You can then monitor all those metrics in Google Analytics. They are updated with each visit from one of your users. Here is a list of those data points she can give you. How does Onpage Hero work? 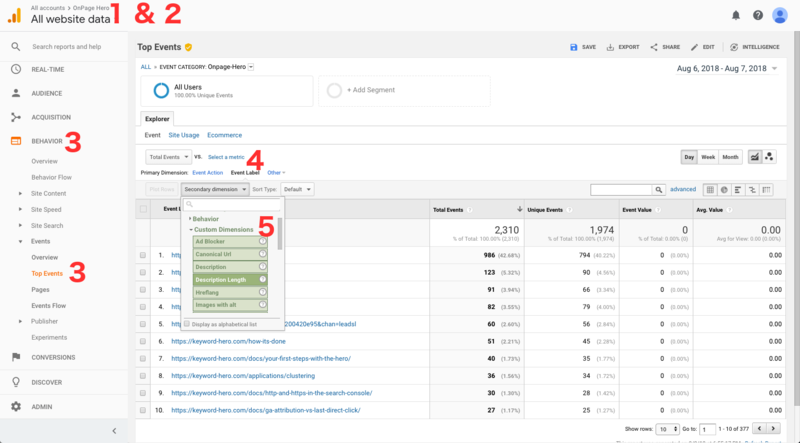 Whenever a user comes to your site and the Google Tag Manager loads, the Hero runs a bit of code that scans the HTML of your URLs to extract a predefined number of SEO data points and uploads them as hits to your GA account. Absolutely not. We took great care in each of the processes so that you and your data are absolutely safe! Is Onpage Hero GDPR compliant? Yes, absolutely. We are only working inside super compliant Google Analytics and add no PIIs (personally identifiable information). Does the Hero also work with Adobe Analytics, WebTrekk, or Piwik? Sure she does. Just shoot us an email: support@onpage-hero.com. How do I disconnect the Hero from my accounts? Just go into your Google permissions settings and disconnect the lady. You have to pay for Onpage Hero if you would like to add more than three SEO data points to your GA account. I purchased the Pro account before, now I'd like to upgrade to Onpage Hero Ultra. You can just pay the difference. Just shoot us an e-mail to support@onpage-hero.com. How do I see all the SEO data? Select the property in which you created the Onpage Hero data points. In the left column, navigate to Behavior and Top Events. Select Event Label as the primary dimension. Add all SEO data points as secondary dimensions from the drop down. When will I get the first SEO data? You’ll have your first data within a couple of minutes after setting up Onpage Hero. Each user that creates hits on any of your landing pages will now update the SEO data. Why is there a maximum number of data points? The Hero creates so called custom dimensions in your GA account for each of the metrics. Unfortunately, in the free version Google Analytics offers a maximum of 20 custom dimensions. You can choose between over 30 data points that the Hero provides. Check here for the full list. Can I change which SEO data points I receive after the first set up? Yes, no problem. Onpage Hero will just overwrite whichever metrics you deselected to make space for the new one. What do all the data points mean? Check here for the full list of data points. I can't set up an account? Here is a step-by-step tutorial talking about you best set up Onpage Hero. If you still won’t get data the next days, reach out to us support@onpage-hero.com.